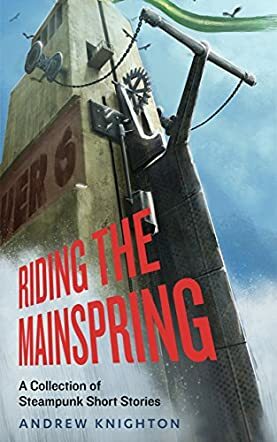 Riding The Mainspring: A Collection Of Steampunk Short Stories is a collection of shorts that ranges from shoot-outs to gangsters and criminals. There wasn't a whole lot of description of the gadgetry involved, which I usually like to have much more of, but the stories themselves were quick, easy and enjoyable. I enjoyed that many of these stories were set in the wild west. While I'm not a western fan myself, I can get on board if there is some steampunk fun added to the action. With the westerns in particular, Andrew Knighton was able to capture the gritty harshness of the people and the world that's shared by both westerns and nearly all steampunk books. I also appreciated how many of the stories had cross-over characters - for example, the boy from "The Cast-Iron Kid" was the sheriff in "The Horse Whose Hooves Cried Thunder." This helped ground me in the time and place of each story, and also helped build upon the world that Knighton was creating. One of the best parts of steampunk, in my opinion, is the spirit of invention and ingenuity that this genre evokes. Inventors, scientists, mad or otherwise, are all treasured and instrumental to the plots. Creativity is key and it's applied via science...via cold hard steel and iron, and that makes for a very cool, very intelligent adventure. Andrew Knighton has done a very good job in creating new American-type stories of the genre that include key aspects of traditional genres like mysteries and westerns.